In a globalized world when countries are working together in different areas such as economic, political, geopolitical, defense, security, and science and technology, media plays an important role in keeping them updated about the actual and ground level realities about different countries. This chapter examines how new media is important in international relations and diplomatic affairs, what role new media is playing in international relations, India's relations with South Asian countries and role of media diplomacy, India's relations with international community and role of e-diplomacy, people's participation in discussion and dialogue in international relations and its impact in diplomatic policies, relation between people's participation and deciding policies and national level, increasing role of new media and changing practice of international diplomacy, and foreign policy adopted by governments. In last few years we are observing change in media practices and reporting patterns in contemporary and digital media. Politicians and government officers who are involved in shaping, drafting and making foreign policies have realised that in the changing scenario using different media to get connected with common people and to get their involvement in making people centric policies is very important . In last few years due to technology upgradation and change in media business models and media practices we are observing changes in the way media produces stories and do their businesses. Media policies and practices adopted at global level also affecting the domestic and local media practices and business patterns. History tells us that Media always played an important role in international, bilateral and diplomatic relations. In this age of information technology both contemporary and new media are playing important role in informing and keeping people update about international happenings and affairs. Now diplomats are using different media platforms, they have adopted new policies, practices and working style to adjust and adopt the changing working environment which is more technology oriented, dependent on technology, more transparent and people centric. Now the strategic and diplomatic relations between the countries are based on public image, by getting reflection through different media outlets, public opinion, information available on digital media platforms in the form of public opinion and views and news which comes from different National and International media channels. In a globalized world when countries are working together in multiple areas like economy, politics, geopolitics, strategic relations, defense, security and science and technology, diplomatic relations between the countries are also shaped on the basis their relation and mutual understanding in all these areas. 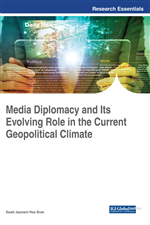 This chapter examines what role new media is playing in shaping international relations and diplomatic and multilateral relations. What foreign policy is adopted by the present government in India to strengthen its relations with the South Asian countries and with international community. What changes we are observing in diplomatic practices in the age of public and e-diplomacy. People's participation in discussions on global affairs and its impact on government decision and in policy making.